We made it back from our trip up north to the Dadant offices in Hamilton and I'm really glad we did the trip! 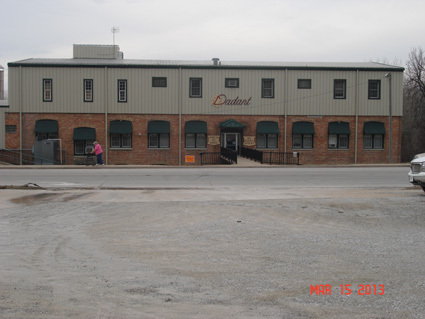 We toured the candle factory in Kahoka MO, the main building in Hamilton IL and the metalwork factory in Dallas City IL. They prohibited cameras inside the buildings all three locations, so I don't have a lot of pictures to share, but the memories are incredible. The factory was near the middle of town, and they produced a large variety of candles including votive, stick candles, religious candles and decorative candles like the ones shown below. We were greeted by staff inside the gift shop, who welcomed us and introduced us to our tour guide. The factory was in full operation, so we had to be careful where we walked to stay out of the way of fork lifts, machinery and workers. We saw where the artists made the religious candles, which they were carving and painting by hand! We saw machines that inserted the wick was into the center of the candles. Some of the candles were actually a long continuous candle extruded from machines, that had a cotton string in the middle and the workers simply cut the candle as it emerged from the extruder at the desired lengths. We also saw lots of tanks with colored wax waiting for candles to be dipped and re-dipped into various colors. While we couldn't take any pictures inside of the main headquarters building, we did manage to get a few pictures outside the building. Below is the main entrance to the building. 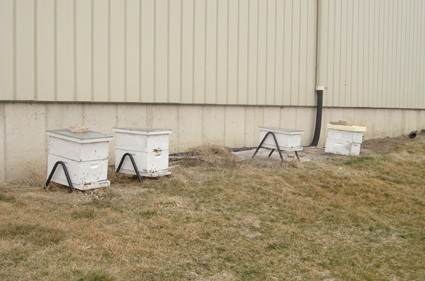 On the side of the building we found a couple of hives. The weather was just warm enough for the bees to be out flying. Some of the boxes had more activity than others, and by mid-day you could really see bees flying through the parking area heading to/from the hives. Inside the factory we waited for our turn to take a tour. We were pleasantly surprised to find complimentary donuts and coffee while we waited. 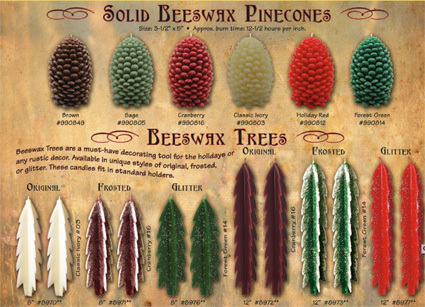 The entire factory smelled of sweet wax and I loved it. Our tour began by viewing tanks that melted bees wax and filtered it for use in making foundation. The next stop was into the thin surplus room, where we saw workers using machines to manufacturer pure wax foundation. The wax was fed into the machine on a conveyor belt and rolled through rollers that pressed the honey comb shaped cells into the foundation before cutting it into the right size. We also saw machines in use that coated plasticell frames with a layer of bees wax. All of my deep frames are (currently) wax coated plasticell frames, so this machine was particularly interesting to me. We toured a part of the facility that held beeswax bought from beekeepers. 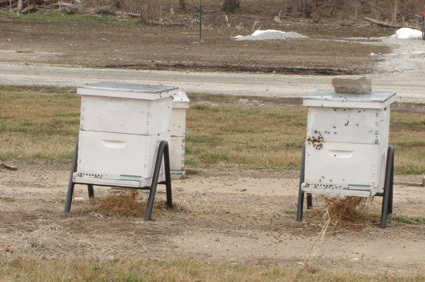 We saw shelves that held large crates full of bees wax several stories tall. They took the wax, melted it, filtered it and fed it back into their system to make more foundation or they would send to their candle factory to make candles. We also saw the automated machine that put the wooden frames together. As long as a worker ensured the machine had a steady supply of each of the wooden components of the frames, it would keep building the frames at a really impressive rate. The metalwork factory was really neat inside. Unfortunately we arrived after the worker's shift ended, so we didn't get to see the machines in action, but our tour guide did a fantastic job describing what each machine and work station did. The factory is the only metal factory that Dadant uses. 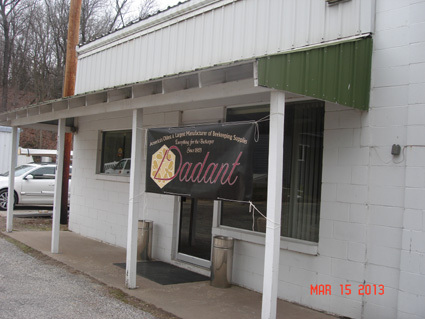 All of Dadant's extractors, large uncapping tanks and smokers are made in this factory and shipped to all of the Dadant branches to be sold around the country and overseas. The factory was full of large stamping, rolling, cutting and welding machinery that worked the raw 304 stainless steel material into beekeeping equipment. Our guide was familiar with the smoker making process and demonstrated how to build a complete smoker lid. You wouldn't think it would be difficult, but there were multiple steps involved to convert a flat piece of stainless steel into a rounded cone with a flared cap complete with rivets and hinge. The candle factory sold factory seconds at their gift shop. However, when we asked about factory second smokers we were politely told they don't sell any factory seconds. Any item that isn't made just right can't go out the door. It was worth a try though right? Are you going to do a full write up on your metal plant experience referenced in your text? I'm on the edge of my seat waiting to hear that one! I'll try to get my write up started tonight or tomorrow morning.